We will pick you up from the hotel in Sharm El Sheikh late night by 10 pm then travel for about 3 hours to wander the sun rise over Sinai desert on a memorable discovery to the place where Moses received the ten Commandments. Travel in private modern air conditioned comfort van with your personal expert guide, Arrive to the point where you would start the hiking experience by 1.30 Am then you will spend about 3 hours heading up to the mountain summit. 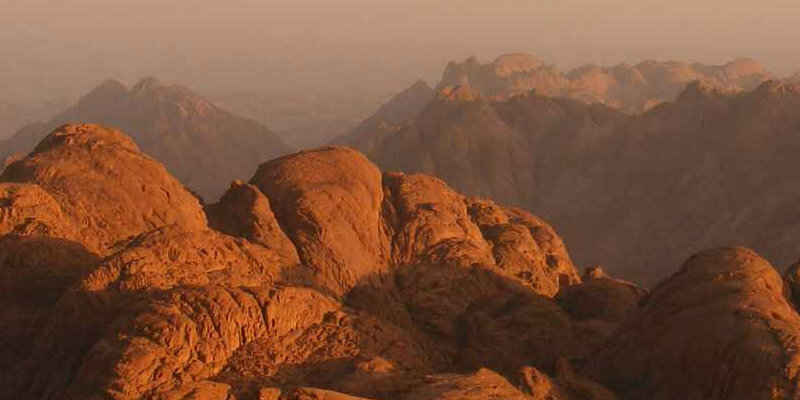 You will admire this unique sunrise view over the sacred Sinai Mountain following the footsteps of Moses when he climbed to receive the ten Commandments. The way up to top is descent but there are about 500 steps at the very summit. In the way back down the mountain you will relish sightseeing journey to St. Catherine Monastery, established between 527 & 565 A.D. It is believed to have been constructed around the site of the Burning Bush. Explore the Greek Orthodox Church, Mosaic of Transfiguration then transfer back to Sharm El Sheikh.